While one hears an awful lot of debate about the tactics used by the Occupy Wall Street movement, there seems to be very little controversy about their positions. Such was revealed in a Pew Research study out late last month, almost half of the Americans surveyed – 47 percent – thought Wall Street’s way of doing business was detrimental to the nation’s economy as a whole. “The typical household headed by adults over 65 had 47 times as much net wealth as one headed by adults under 35 — $170,494 versus $3,662 (all figures expressed in 2010 dollars). Back in 1984, this ratio had been less lopsided, at ten-to-one. In absolute terms, the oldest households in 1984 had a median net wealth $108,936 higher than that of the youngest households. In 2009, the gap had widened to $166,832. In other words, we’re seeing a growing divide not only between the rich and the poor, but between the old and the young as well. This doesn’t mean we should eat the old as well as the rich, nor does it mean that age is an assurance of wealth. Indeed, there are a great many older Americans living a very meager life. But neither does it mean that age is any guarantee of growing wealth. In fact, it means very much to the contrary. Older Americans who have lived for some time in the same residence doubtlessly purchased their homes well before the housing market swelled into a massive, thin-membraned bubble, whereas younger Americans most likely purchased their homes at the inflated prices precipitated by the bubble. So while the ebbing tide has lowered all ships, older Americans had much less further to fall. Older Americans also benefitted from decades of relatively steady growth in employment opportunities and income; a benefit that has not been available to Millennials and Generation X-ers who have found no such promise of optimistic prospects in their careers. Younger people are more likely to be faced with a hand-to-mouth existence in a land of plenty, surrounded by the excesses of wealth and the empty promises of a better life. Meanwhile, we learn that members of Congress are lawfully engaging in a form of insider trading, using information privy only to them about publicly traded companies to make business decisions for their benefit. We have a justice system that views corporations as people when it comes to free speech, but not when it comes to criminal accountability. We have prospects that are bleak and looking bleaker still. In light of everything, it’s a wonder that the least of “the establishment’s” problems are these Hoovervilles in city parks. Knowing what we know now, I’m astonished that we’re not engaged in full-throated revolt. Why, we must assume, has to do more with the unique, passive way these young Americans are expressing their dissent. Rather than throwing bombs and stones, they are quoting Martin Luther King, Jr., and occupying the public space to give a face to our public shame. They are being forced from their encampments in New York, Atlanta, Oakland and elsewhere. They are being taunted and harassed by city officials with little concern for the Constitution and virtually no appreciation for the fact that, if not for the peaceful means of protest adopted by the Occupy movement, they would have a much larger problem on their hands. In London, just this summer, the discontent took a violent turn, with flash mobs that turned to riots and destroyed buildings that had survived even Nazi bombing campaigns. Here, on the other hand, dissent takes the tone of tents and chants that turn sour only when boot-toed thugs with riot gear are ordered to abuse the right of the people to peacefully assemble and request redress for their grievances. Those who have taken to the streets, who have become, en masse, the face of our national debate and living reminders of what’s wrong with our nation – with the way we are cannibalizing our own and destroying the American dream – are to be admired. We are only days removed from Veteran’s Day – once called Armistice Day. On the eleventh hour of the eleventh day of the eleventh month, etc., etc. We recall that people gave their lives for liberty, and we celebrate the fortunate who returned for the scars they yet carry. But we look to the parks, and we wonder what it was all for, when the America for which they fought is best expressed by an American flag flying from a makeshift pole outside a tent pitched in a city park. In their name, and for their sacred honor and ours – for the millions with nowhere else to go – I implore you to continue. Do not be scared. Do not go quietly into the shadows. Find your place in the square, in the sun, hold high your flags and signs and raise your voices. The 99 percent shall not be denied. Karl Marx would have been surprised to see that the revolutions he envisioned began in the East, in countries dominated by emperors and czars. When he and Friedrich Engles wrote “The Communist Manifesto” in early 1848, it was believed that the revolutions would begin not in eastern countries like China and Russia, but in Western Europe and the United States. Communism, he reasoned, was not so much a movement but an organic thing; something that grows quite naturally from capitalism. Occupy Atlanta: It has begun. Inevitably, he wrote, the gap between the rich and poor would grow too wide to breach. When this happens, the poor – left without food, clothing, shelter and other necessities – would turn to the only advantage they had remaining: their muscles, and their numbers. In a great turn, society would dispense with inequality and adopt a structure in which everyone was equal. In the United States, this inevitable turn has been held back by the middle class – a uniquely American tradition in the vein of Thomas Jefferson’s beloved yeoman farmer. People who own their home have an investment – a substantial one – in the way things are. They may not ever be rich, but they find solace at least in the fact that they are not poor, either. Life is not extravagant, but it is not toilsome and terrifying, either. Life is lived in the middle. But the middle class has come to wane mightily. People who once had an investment in their community have been disenfranchised. They have lost their jobs and their homes. Desperation has begun to sink in as it grows ever clearer that corporate bailouts and tax breaks will not spur job creation, and a block of wealthy state and federal legislators remain hell-bent on blocking all legislation at relief for the nation’s growing population of poor. They are taking our Medicaid and Medicare, they are taking our welfare, they are taking our housing benefits. They have the audacity to assert that the jobs and homes are gone not because their friends played fast and foolish with other people’s money and not because so many were conned into buying more home than they could afford by bankers who offered twisted mortgages for short-term profit; rather, it is the fault of the unemployed and homeless. Now, the streets are filling with people. Wall Street, Austin, Boston, Los Angeles, Atlanta – the urban centers of the blight and loss that has defined the past decade. They are speaking words not spoken in public squares in a generation. They are holding signs and standing with upraised fists. 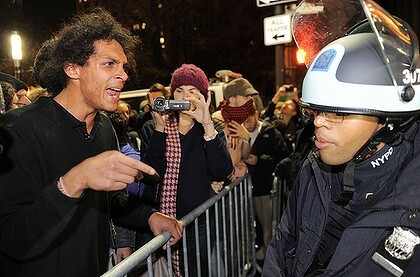 In New York, they are going toe-to-toe with the New York Police Department, standing their ground in the face of pepper spray and billy clubs. It seems only a matter of time before the crowd reverses the violence. Sweeping change does not come easily to this country. The battle for civil rights took decades. Gays and lesbians are only now beginning to find acceptance in facets of society. But the terror now is the growing number of poor. News in recent weeks have carried reports of the soaring costs of peanuts, which are used to make peanut butter, which is a staple food in many poor pantries. Peanut butter sustained me during the hard years of my life. It is rich in protein, it is nutritious, inexpensive, and it is filling. The cost of peanut butter is not soaring because of some blight that befell the peanut crop; it is because farmers took advantage of climbing cotton prices and planted cotton instead of peanuts. The farmers chose profit over feeding America, and consequently, thousands of families will go hungry and suffer further malnutrition because they cannot afford to buy from the store, and because food pantries can no longer afford to stock, peanut butter. And that is but one example. Take petroleum as another, or the cost of clothing, auto parts, electricity, debit card fees, natural gas, and the list goes on. There are hundreds of ways that American families are being squeezed in the name of turning corporate profits. The money is going not to creating jobs, but into the pockets of the ever-slim number of people who can afford to own stock. And now, the streets are filling with protest. To a student of history, this is nothing new. It’s happened before. Just, not here. It’s happened in Russia, China, and northern Vietnam. It’s happened in Cuba and Korea. It’s happened in places where the poor were many and the rich were few and there was nothing between the two. And now, the middle class is drowning, the lines for unemployment and public relief grow ever longer, and a vocal minority in places of power continue to cut and cut and cut the very programs that have made life livable at all, heaping suffering on the poor (and worse, doing so in the name of Jesus Christ – for shame!). So the streets are filling, and the protests are spreading. Not as violent as those in London, not as detrimental as those that wracked Europe. But they come on the heels of protests that brought down governments in other parts of the world, and in western Europe, the anger is still kindled. We are running out of time. We have seen the Arab Spring. We are entering the American Fall.